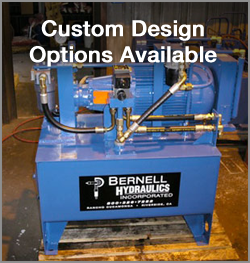 Bernell Hydraulics is proud to be your premier source for hydraulic power units in Downey CA. We not only sell hydraulic power units for all kinds of equipment, but also service and repair them. We invite you to stop by one of our locations to learn more about how we can help you with your power unit. If your hydraulic power unit is acting up, feel free to call us. We offer 24 hours on site repairs and service, so you can get the help you need right away. We also offer a special onsite hose repair service as well as maintenance services like fluid flushes and diagnostic tests for your hydraulic power units. Remember, your hydraulic power unit is the heart of your system so don’t neglect to get it the attention it deserves. At Bernell Hydraulics, we’ve been dealing with hydraulic power units in Downey CA and all kinds of other components since 1977. We really do know this business and you can rely on us to provide exceptional sales and repair services.